On the heels of last week's post about A Ghost a Witch and a Goblin, here are two more vintage titles filled with ghost stories from Scholastic Book Services. 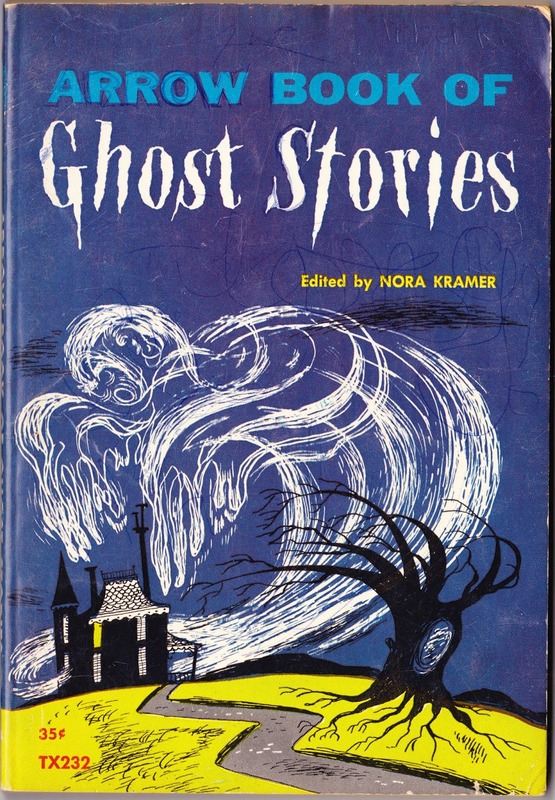 First up is Arrow Book of Ghost Stories, edited by Nora Kramer and illustrated by George Wilde. It was first published by Scholastic in 1960, and this is the seventh printing, from 1965. It's a wonderful cover — it would have easily landed in the Top 5 of last year's Scholastic Countdown — that's only slightly lessened by the blue-pen scribblings of some little devil long ago. Karswell wrote about this volume in 2011 on the And Everything Else Too blog and included scans of much of Wilde's wonderful interior artwork, which you can check out there. "Cobbie Bean" is the longest tale in the book, taking up 37 of its 116 pages. 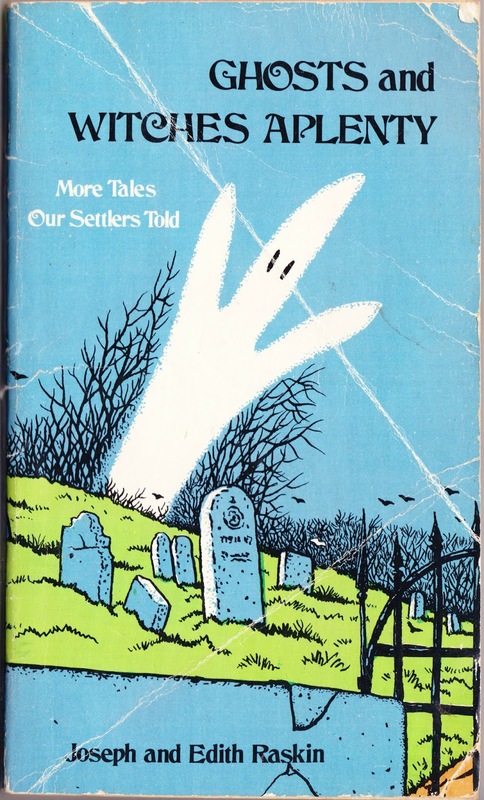 Today's second title is Ghosts and Witches Aplenty: More Tales Our Settlers Told. This is the followup to The Witch House and Other Tales Our Settlers Told, which was featured on Papergreat last October. This well-creased copy was again written by Joseph and Edith Raskin, a husband-and-wife team, and was published by Scholastic in 1973. The illustrator was again William Sauts Bock, a Pennsylvania artist who now goes by William Sauts Netamuxwe Bock and has the website Heart and Soul Artworks. Tales in the 124-page book include "The Riddle of the Room Upstairs," "The Ghosts of Gibbet Island," and "The Witch Who Spoke in Many Tongues." "All the stories in this special Arrow edition of Ghosts and Witches Aplenty are complete and unabridged. However, the second and fifth stories of the original hard cover edition were omitted, since they were not about ghosts or witches." 1. Mystery of the Witches' Bridge has been written about by BellaOnBooks's Blog, Bill Cameron, the bookwyrm's lair, and The Kid Books Review, among others. 2. "They did not wink, they did not blink." I had that Arrow Book of Ghost Stories when I was a kid. The funny thing is, it had pen marks on the cover too. 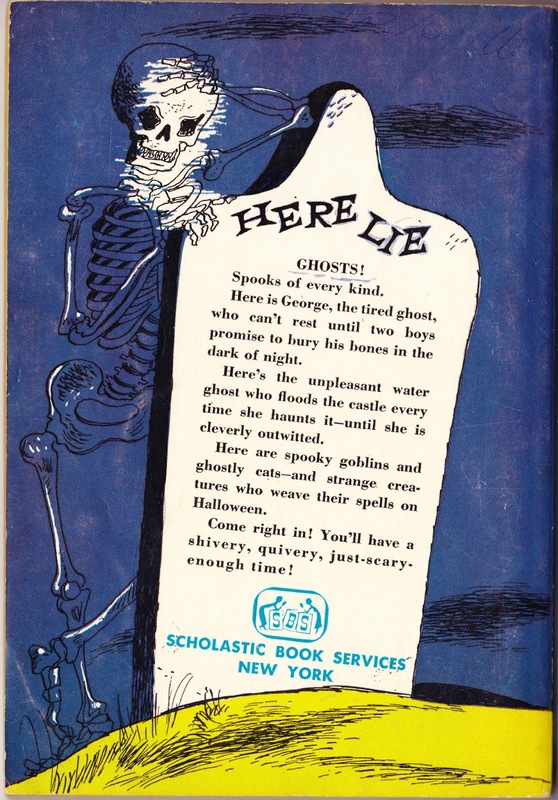 I also had "13 Ghostly Tales" which is another Scholastic collection in the same vein. Run, little boys, run! Run from the Pumpkin Man!